Those words could well have been written for New Zealand sporting personality, Keith Hancox, who died on January 21 2019. Let’s consider the line that says, “The evil that men do lives after them.” Certainly that is true for Keith. This is how that portion of Keith’s life was reported today on the Stuff website. Hancox, who had persuaded Robert Muldoon’s National government to establish the Sports Foundation, was given the top job running it in 1978. He pleaded guilty in the Wellington District Court to 482 charges of fraud and forgery. He had used the money to fund a lifestyle of travel, boats, and general high living beyond his already generous salary. Hancox was sentenced to four years after being given credit for his previous good record and glowing character references. He served 17 months at Wellington Prison. According to one associate, Hancox was a paradox: a classically tragic figure who deserved both a prison sentence and a knighthood. Cementing his humiliation, he was expelled from the Sporting Hall of Fame he helped to create, and to which he had been entered for his swimming achievements. The Stuff report is true. Stealing a million dollars from the athletes he was there to serve was serious. However equally serious is the 19 days it has taken news outlets to acknowledge his death. Equally despicable is the failure of Peter Miskimmin, Bruce Cotterill and Steve Johns to recognise the passing of an exceptional New Zealand swimmer. Sure, he was flawed but Miskimmin, Cotterill and Johns had a duty to honour Keith’s contribution to sport and to swimming – and they failed. So let’s consider the next Shakespearian line, “The good is oft interred with their bones.” There was a lot of good in Keith. Here is how the Stuff website described that side of Keith’s life. In 1964, at age 25, he became the second person to swim Cook Strait, completing the 23km crossing in nine hours 34 seconds. The following year Hancox swam the 33.8km English Channel, knocking it off in 15 hours 33 seconds. He was the first New Zealander to accomplish the crossing. 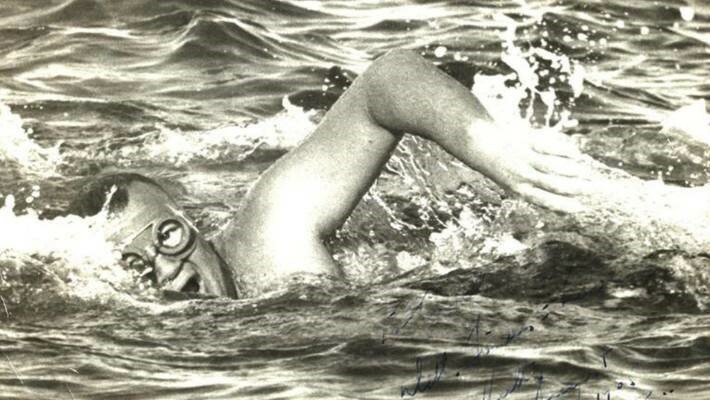 Hancox, who played water polo for Hawke’s Bay and Wellington, also represented New Zealand in Canada in a 1968 marathon swimming team. After an 18-hour swim he was admitted to hospital, where 2lb of silt from the murky lake was removed from his stomach. Swimming was his main focus but Hancox – a big burly man even in his early years – was also a wrestling champion winning the New Zealand amateur heavyweight title in 1957. Out of the water, Hancox lent his skills to sports administration. He was a member of the NZ Surf Life Saving Council and the National Water Safety Commission. He was the secretary of the Royal Life Saving Society’s Hawke’s Bay Centre and of the Wellington Surf Life Saving Society. I remember Keith with fondness and respect. For a short time we had the same coach, Tony Keenan. Much later, after Keith had retired from swimming and was working as a parliamentary journalist I became interested in swimming Cook Strait. I went to see Keith in his Parliament Building office. He carefully explained the preparation I would need for the swim. He recommended that I should swim a final trial he used before his marathon swims. A few weeks later I set off from Worser Bay with Mexico City Olympic Games swimming representative, Pru Chapman, escorting me in a boat. Keith’s trial involved swimming across the Wellington Harbor entrance to Eastbourne, then along the shoreline behind Somes/Matiu Island, across to the Inter-Island ferry terminal and finally across the harbour to Oriental Bay. Believe me that is quite a trial. Not much university study was done for two or three days afterwards. Keith wrote a glowing report on my swim in the Dominion newspaper and predicted success for my Cook Strait attempt. I didn’t tell him that behind Somes/Matiu Island I had asked Pru to let me into the boat. She did not reply but drove the boat well out of reach, a hundred metres ahead, and stayed there until we reached Oriental Bay. Through that time, Keith’s care and interest in my efforts were first class. He knew sport well and cared for those whose efforts he respected. I was supportive but didn’t think she had much of a chance. The time was over a second and a half faster than she had ever swum before. Two nights later, after the final of the women’s 100m freestyle Toni was $5,000 better off and the New Zealand record had taken a big step forward. Keith invited Toni to lunch at the Sports Foundation and presented her with a huge metre long cheque. The publicity for swimming was first class. You’d wait a while to see that sort of initiative coming out of Sport NZ or Swimming NZ these days. The bureaucrats involved are too busy spending our money on themselves. For years I have debated a strange paradox. Sure Keith skimmed money illegally from the Sports Foundation. But is that all that different or worse from the legal skimming that is rampant in New Zealand sport today? I think I’d rather have the good things Keith did even if he did have his hand in the till than the financial gluttony with no Keith-like initiatives that we have today. And so, thank you Keith for your contribution. Rest in peace. New Zealand sport is a better place for your contribution. That should be recognised by putting you back in the New Zealand Sporting Hall of Fame. This entry was posted on Saturday, February 9th, 2019 at 3:31 pm and is filed under Training . You can follow any responses to this entry through the RSS 2.0 feed. Both comments and pings are currently closed.